Curry Tonkatsu in NYC’s Midtown, Katsu-Hama Restaurant. It’s heavy and delicious, and tastes better than it looks. When I think of comfort food, this is one of the things I think of: Japanese curry tonkatsu. It’s somewhat spicy, savory, and crunchy, a pork-based meat-and-potatoes kind of dish (especially if the curry has potatoes in it) that is perfect for a winter dinner. This dish is usually served with shredded cabbage (which is in the bowl that is only partially visible in the upper right hand corner of the photograph). When I lived in Tokyo, I ate a lot of curry tonkatsu. Only a few restaurants did it exactly the way I liked it (though even when it wasn’t great, it was still good). Lucky for me (though maybe not my waist) was that a restaurant that always had the right amount of crunch on the breaded pork, and the right amount of juiciness of the pork, and just the right amount of spice in the curry was a few doors down from my office in an area of Tokyo between Akasaka and Roppingi, not far from the ANA Hotel. 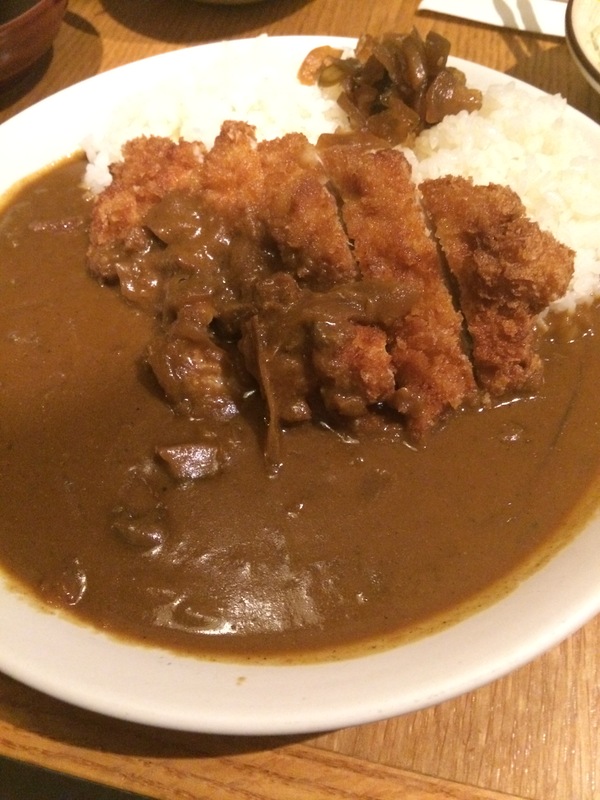 The cool thing about katsu-curry is that it is such a wonderful hybrid meal. Most people think “sushi” when they think of Japanese food, and not breaded, fried, pork cutlet. Ton, afterall, is the Japanese word for “pork,” while katsu is supposedly the Japanization of the English word “cutlet,” so that part of the meal is a Japanese-Western combo. Meanwhile, curries are more often association with South Asia, though supposedly for the Japanese, their version of curry came from India but via England. Thing is, since moving back to the US now more than 20 years ago, I haven’t been able to find a katsu-curry that lives up to what I experience in Tokyo. Until now. The Katsu-Hama Restaurant in midtown Manhattan does the katsu-curry right. I recommend it.